Kid Academy is a state of the art pre-school and childcare facility. 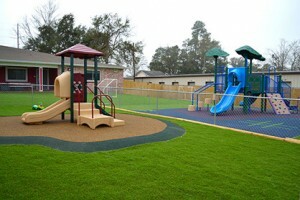 Established in 2000, Kid Academy is a state of the art pre-school and childcare facility like no other on the Mississippi Gulf Coas t.
Locally owned and operated, Kid Academy sets itself apart with true customer service and a curriculum that fully prepares its students for kindergarten. Kid Academy’s exclusively designed curriculum uses language, phonics, math, science, handwriting, art, physical education and moral values. Being a non-denominational Christian preschool, the curriculum also includes weekly bible study. Putting the safety and the protection of their students first, Kid Academy features a 16 camera system with DVR recorder as well as an entry code system that requires anyone entering the school to use a 4-digit entry code. Known as the “The Gulf Coast Premier Pre-School” and “Gulfport’s only TRUE Preschool”, they offer an amazing pre-school experience for children and their entire family.